Pancharatha Temple is a highly revered shrine at Sonpur, in Odisha. 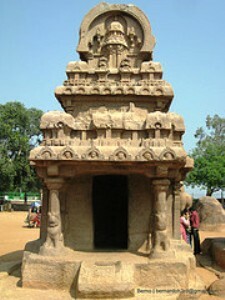 This beautiful temple, constructed in a chariot size, resembles the Sun Temple at Konark. As many as five temples are built up on a single platform here. Lord Siva, Ganesh, Kartikeya and Rishava along with Goddess Parvati are worshipped here. Most noteworthy feature of the temple is that the idol of Lord Ganesh faces east; generally in all Shiva temples the idol faces south. It is believed that Pancharatha Temple was built by King Birmitra Singhdeo to commemorate the death of his son Prince Somobhusan. Balangir Railway Station is the nearest railhead.